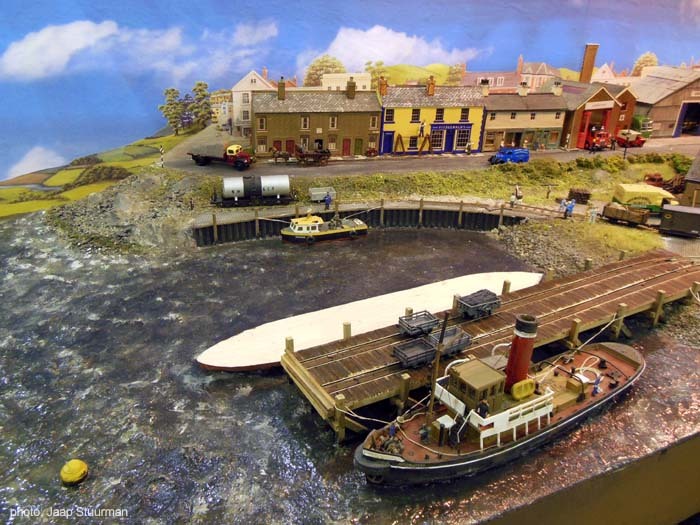 This new layout by Jaap Stuurman shows a small harbour town in Wales during the 1950s, served by a narrow gauge railway. For Welsh speakers the name of the layout will be familiar - it means literally 'I am sorry'... Having been involved in the Talyllyn Railway for many years I picked up a smattering of Welsh, so I thought this was a good idea. 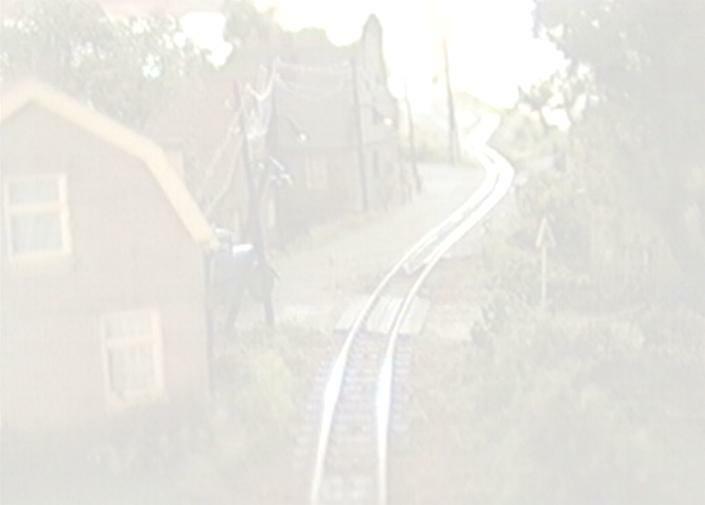 The scenic part of the layout is in three units. The centre one is the railway station which also is the passenger terminus. An engine can run round its train and couple up for the return trip. In the foreground there is a small goods depot, at the back there is the town with a few shops, the local pub, the fire brigade and the local Crossville bus depot including a number of typical buses of this well-known company that used to be a familiar name in a large part of Wales and Merseyside. To the left there is the harbour area with a jetty that will feature a coasting vessel being loaded. Usually they would pick up a cargo of slate, but it might be something different like beer from the local brewery. In front of the jetty is a tugboat ready to cast off. The boiler is in steam, in view of the smoke emitted by the funnel. The town scene continues from the centre unit with some houses along what we will grandly call the 'promenade', and one or two warehouses. Part of the quay siding has been lifted for track maintenance. To the right there is the local Dragon Brewery, quite a big one for a small town, with its own siding to facilitate transport elsewhere in the area. Some of the transporting is being done by lorry. Behind the brewery a standard gauge line emerges on the high level, which runs through the landscape for a short distance to disappear into the fiddle yard. It's only a short line but it was included to show the contrast between standard and narrow gauges. Behind the standard gauge there is some grazing for sheep and there is rather more open landscape than on the remainder of the layout. The fiddle yard is a staging area for the layout, enabling me to set up various trains to be processed in the station. 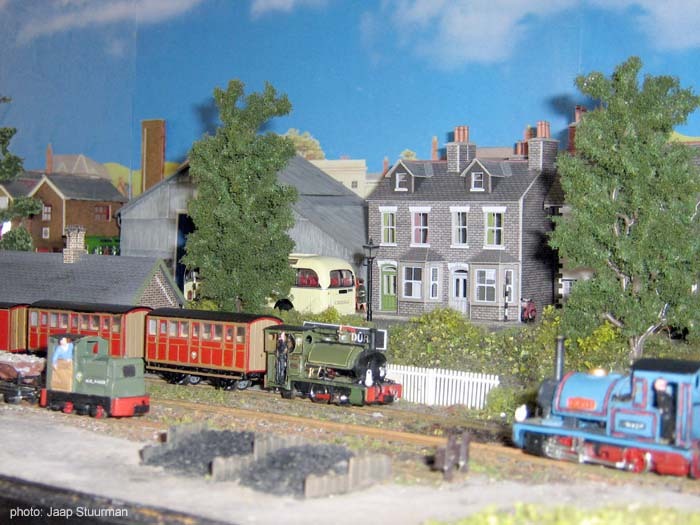 The standard gauge is truncated on the fiddle yard - there is just a diesel multiple-unit on an automatic control circuit running back and forth. 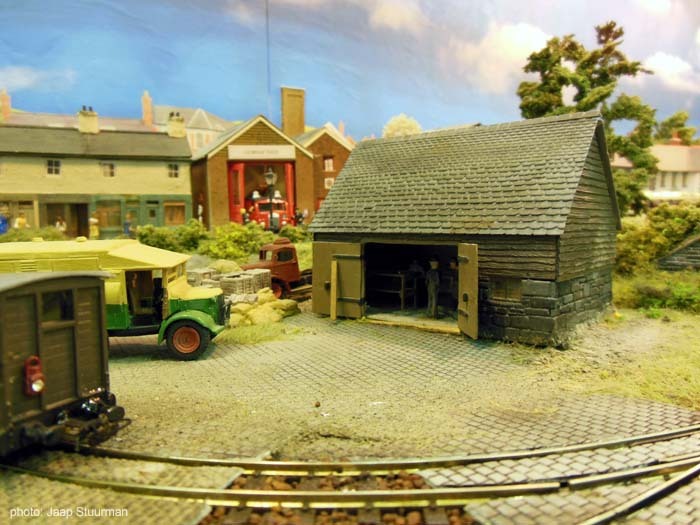 In railway modelling you need to make a choice, and mine of course leans towards the narrow gauge. Plan and photos by Jaap Stuurman. 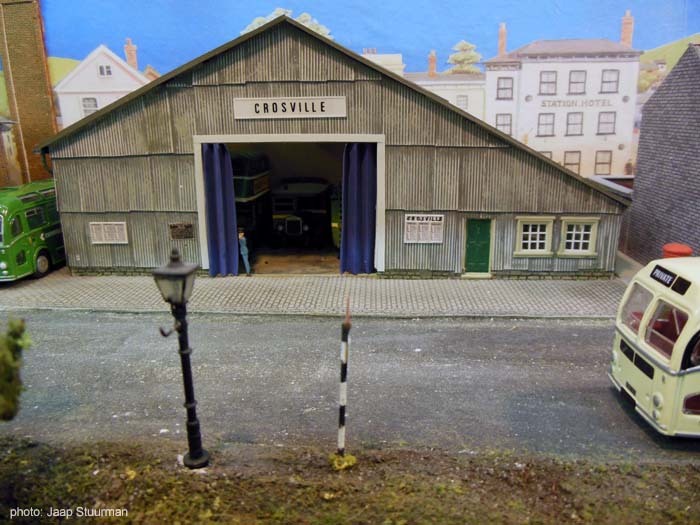 A close-up view of Crosville's local garage. 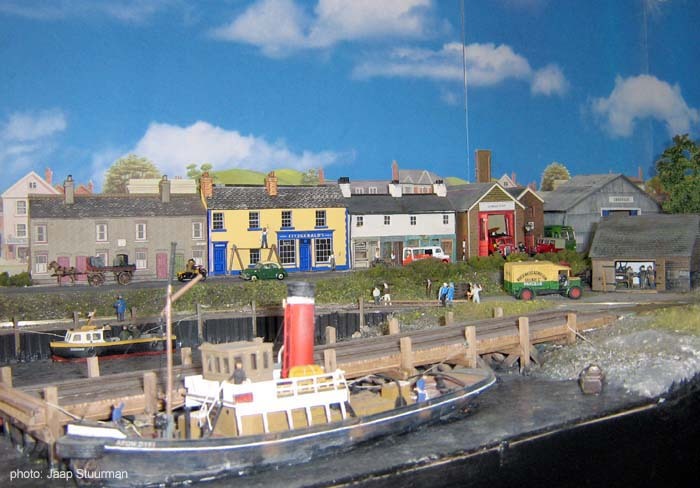 with nicely modelled water, ships and waterfront scenery. 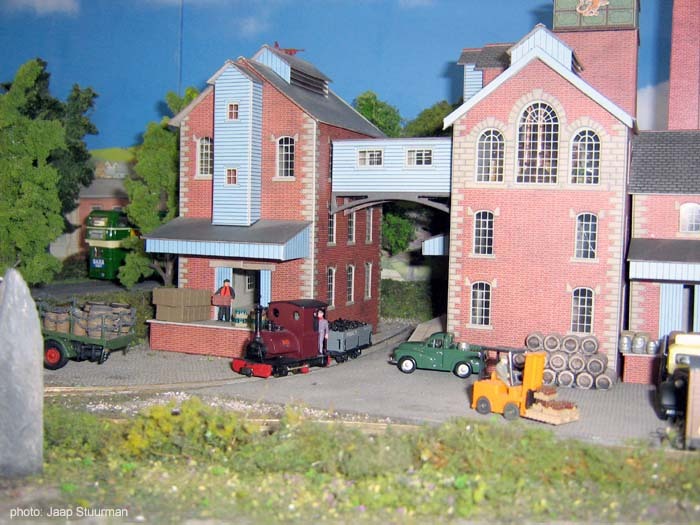 The goods shed in the dockyard.